(11 July 2018) Now in its sixth edition, Best of UNICEF Research continues to be a fertile source of inspiring, rigorous and influential evidence. Each year, UNICEF’s Office of Research—Innocenti invites UNICEF offices around the world – including country offices, regional offices, national committees, and headquarters - to submit recent examples of research for children. The aim is to bring attention to work that contributes to shifting policy agendas and has a high potential for impact on policies and programmes that benefit children. Fourteen-year-old Amina Hassan (name changed) in the Ifo refugee camp near the Kenya-Somalia border. Amina has never attended school and was married off by her parents at age 12. Showcasing some of the most innovative and rigorous research coming out of UNICEF, the winners cover a range of topics, locations, cultures and levels of economic development. Following an internal review of 105 eligible submissions, UNICEF Innocenti staff identified 12 finalists which were then independently reviewed by an external panel of international experts. Produced by UNICEF Kenya with the Ministry of Health, Ministry of Labour and Social Protection and UNFPA. The panel commended this piece for its grounded inquiry through its exploration of local perceptions. Prioritizing understanding over condemnation, the study takes a step towards working with communities rather than against them to expedite the eradication of harmful practices. One of the study’s main strengths is its comprehensive mixed methods approach. This allowed for a detailed and thoughtful discussion including considerations about gender, ethnicity and religion. Produced by the Ministry of Social Solidarity (MoSS), the Central Agency for Public Mobilization and Statistics (CAPMAS), and UNICEF Egypt. This innovative report provides evidence to inform integrated interventions to address child poverty. Using a life-course approach and focusing on the child as the unit of analysis, the report effectively captured children’s different experiences of deprivation. A strength of the report was the clear linkage of the results of the study with existing policies and the SDGs. Produced by UNICEF Brazil, the Legislative Assembly of Ceará and the Government of Ceará. The panel found this report to be a “brave and compelling study that offers an innovative and captivating way of conducting and presenting research”. Complementing the deep scope and robust analyses, the report uses a story-telling approach to magnify its impact. By using the biographies of young people who have been murdered, as well as gathering data from family members and statistical data on young people’s experiences, the study achieves an effective integration of quantitative and qualitative analyses. UNICEF Innocenti is particularly excited to see that the three winners are from countries that have never before been shortlisted as finalists for the Best of UNICEF Research. 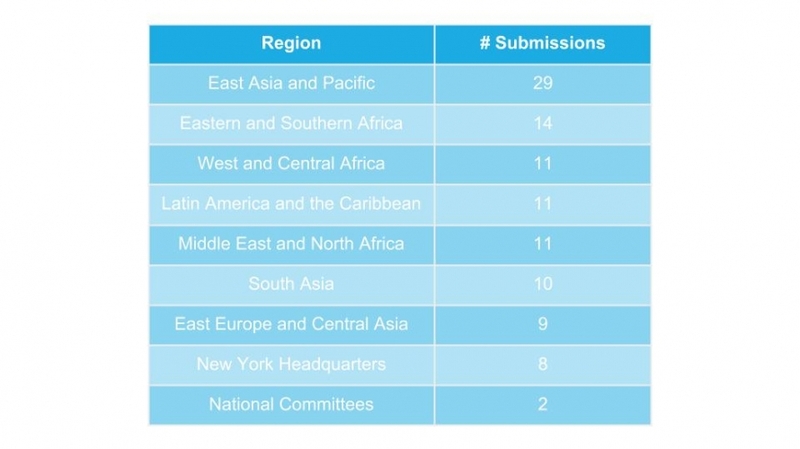 It is motivating to see a submission by the MENA region among the top three for the second year in a row, as this region is typically underrepresented when compared to other regions’ number of submissions. The most prevalent themes this year include child protection and health, as well as submissions with cross-cutting themes. Following a 2016 review of assessment criteria, ethical considerations were given a high priority, meaning that any submissions that fell short of ethical standards were not considered for shortlisting. While the quality of submissions significantly increased this year, disappointingly many high-quality reports were deemed ineligible or poorly rated due to an insufficient concern over ethics. Of 105 submissions, 16% failed to report on their ethical procedures, while only 10 submissions were found to have reported ethics to a high standard, including how consent was sought and a discussion of any potential ethical issues. UNICEF Innocenti is committed to ensuring that all research undertaken by UNICEF and its partners is ethical, and has developed procedures and guidelines to help researchers ensure ethical research involving children. Commenting on the twelve finalists, the panel found that all reports produced findings that are very relevant to UNICEF’s work and country-specific priorities, with many already impacting national policies and programmes. Reviewers noted that while many studies align to current needs in the country of study, others stood out thanks to their original approach. When assessing impact, the panel found it challenging to select between innovative projects and those that focused on familiar topics that continue to impact children in low and middle-income countries. China: What could cognitive capital mean for China's children? UNICEF staff can read all 12 finalist’s reports on our Teamsite. For those outside of UNICEF, the Best of UNICEF Research Report will be available online and in print by the end of the year. In the meantime, you can explore previous Best of UNICEF Research publications. Thank you to our external panel for their time and comments. The panel as composed by Nicholas Alipui (Senior Visiting Scholar at Yale University Mac Millan Center for International and Area Studies and former Director of Programmes for UNICEF), Virginia Morrow (former Senior Research Officer/Associate Professor in ODID and Deputy Director of Young Lives), Aravinda Meera Guntupalli (Senior Lecturer in Public Health at the Open University), and Eliya Zulu (Executive Director of the African Institute for Development Policy).